CONCORD, N.C. (Sept. 18, 2012) - NASCAR Sprint Cup Series champion Tony Stewart joined officials from Charlotte Motor Speedway and Bank of America to kick off the “Express Your Thanks” flag program to benefit the Wounded Warrior Project. Fans attending the Oct. 13 Bank of America 500 can sign a flag with a message of support for the U.S. Armed Forces that will be displayed during the race in a giant flag mosaic. For each flag that is signed, the Bank of America Charitable Foundation will donate $1 to the Wounded Warrior Project, up to $250,000. Fans can also upload images and words of thanks to www.bankofamerica.com/troopthanks and tag Instagram or Twitter pictures with #troopthanks in addition to signing the flags. Funds raised from “Express Your Thanks” will be used for Wounded Warrior Project economic empowerment programs. Stewart, driver of the No. 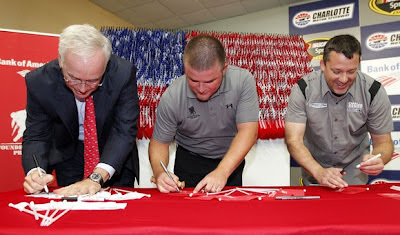 14 Office Depot Chevrolet, signed the first flag, along with Charles Bowman, state of North Carolina and Charlotte market president for Bank of America and Jason Pratcher, area outreach coordinator for the Wounded Warrior Project. Charlotte Motor Speedway officials also announced that country music superstars Big & Rich will perform prior to the Bank of America 500 on Oct. 13. Charlotte Motor Speedway is famous for elaborate pre-race shows and this year’s will also include world-famous tightrope walker Nik Wallenda, who will walk a high wire from the grandstands to Victory Circle, at times more than 100 feet above the ground, and the Teenage Mutant Ninja Turtles. “Charlotte Motor Speedway has always been the benchmark for pre-race shows and thinking outside the box,” said Stewart. “Whether it’s jumping school buses or military pre-race shows, it’s always been entertaining. With the Bank of America Weekend Pass, fans won’t miss a minute of the action with a reserved frontstretch seat to the only Saturday night race in the Chase for the Sprint Cup, the Bank of America 500 (Oct. 13), the Dollar General 300 (Oct. 12) and Bojangles' Pole Night & UNOH Southern Slam 150 (Oct. 11). Ticket packages start at just $99. Fans can also add a choice of a scanner rental, NASCAR Hall of Fame Ticket or Race Shop Tour upgrade for just $25. To purchase tickets, call the Charlotte Motor Speedway ticket office at 1-800-455-FANS (3267) or visit www.charlottemotorspeedway.com. To stay up to date with everything going on at the greatest place to see the race, log on to www.charlottemotorspeedway.com or connect with Charlotte Motor Speedway on Twitter at www.twitter.com/CLTMotorSpdwy or on Facebook at www.facebook.com/charlottemotorspeedway.